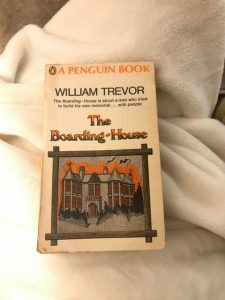 Last autumn I posted about William Trevor’s 1965 novel The Boarding House. 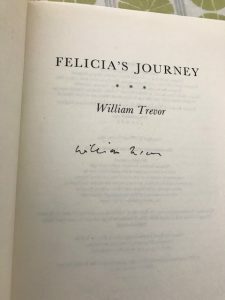 Thirty years later Felicia’s Journey also takes as its central theme the preying upon lonely and desolate souls by sinister, duplicitous monsters with secrets in the murky basements of their souls. In the earlier novel, however, Trevor’s predators are motivated mostly by mediocre, secular avarice and envy; here he ramps up the psychomachy – mortal, not venial sinfulness. Felicia is an innocent (but not entirely naïve) young woman from a sheltered, conservative small town in Ireland, made pregnant by a predatory chancer named Johnny who abandons her with a transparently fictitious account of his leaving for a job in a factory in the industrial English midlands. She sets out on a hapless quest to find her errant lover – who she only half believes is a decent man. Her journey slowly reveals itself, largely without her fully realising it, to be a struggle for her very survival. She falls into the path of Mr Hilditch, an obese catering manager at another anonymous midland factory. We know from his first offer to help this ingenuous waif, adrift in the heartless wastelands of post-Thatcher England, that he is not motivated by kindness. The present-tense, third-person narrative draws us inexorably into the fiendishness of Hilditch’s plan: he cunningly restrains himself from showing his hand too soon, knowing when to back off and leave fragile, needy Felicia to flounder in a heedless world, and to turn in her desperation to his apparent beneficence. 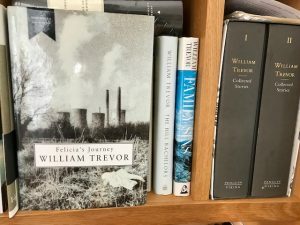 What makes the novel almost unbearable to read is the tension and dread that build as Felicia falls more inescapably into his clutches as he circles round her faltering, impaired waif’s downward progress. I bought my hardback first edition in a craft sale in Penwith, Cornwall. 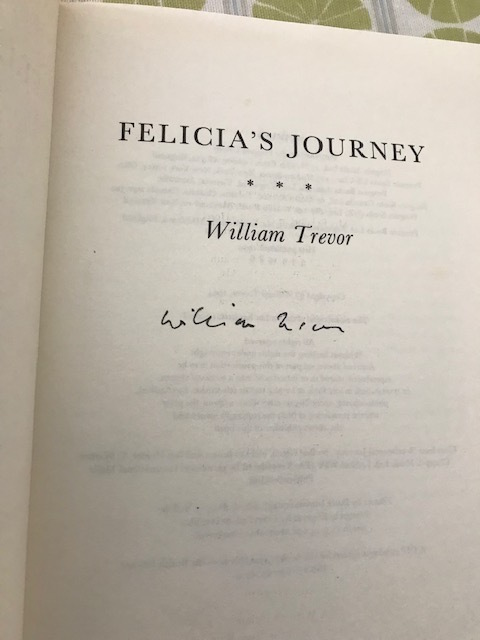 It’s signed by the author – which clinched the sale for me! Trevor is too subtle a writer and too astute and precise a psychologist to reveal too soon Hilditch’s capacity for duplicity and evil. One desperately wants to cry out a warning to Felicia as she reluctantly enters deeper into his lair and her danger becomes more apparent. The narrator gives us access, dimly but increasingly clearly delineated, to the cruelty that he’s been capable of the past, and is meticulously preparing for again. Felicia, whose name is so ironically inappropriate for her sad, unfortunate life, is suspicious but friendless, and desperately unprotected. Trevor’s other player in this struggle for a floundering soul is the unlikely figure of Miss Calligary, a member of a bizarre Christian evangelical group who doorstep homeowners to try to ‘gather’ them to the Lord, promising a paradisal new life for ‘one who dies’. Hilditch writes them off as ‘nutters’. It’s a typical Trevor feat, to manage grim, sardonic humour in a plot that begins with such gothic premises. For these evangelists appear to long for death, albeit symbolically, in order to be reborn; Mr Hilditch offers the real thing, with no spiritual intent at all – his menacing mission arises out of his own damaged psychopathy. (The narrative gradually reveals, through flashbacks in his memory, the probable traumatic causes for his affectless depravity – even he has a certain redeeming pain). With narrative deftness, Trevor causes Miss Calligary’s mission inadvertently to intrude upon Hilditch’s, with devastating consequences. As in Trevor’s other fiction, his sympathy is with the lost and marginalised, those deemed by society – and maybe themselves – to be superfluous (homeless people feature with increasing significance in this novel), those who render themselves attractive to life’s predators by their human frailty and a profound but unfulfilled need for love that disables their defence mechanisms. Somehow they usually stumble into redemption, or their world reveals itself capable of a grim, oblique kind of grace. A lesser writer would have failed to create such nuanced characters who could have been portrayed as simply monsters and victims. Trevor imbues them with complexities and unexpected depths of humanity that take this novel into heights (and depths) undreamt of by the anonymous authors of the medieval allegories. This passage shows the insidious humour of this darkly funny novel. The narrative voice is corrosively, brilliantly ironic. Bird has deliberately chosen as his heirs to the property – a ‘place of my own invention’ as he boasts to a potential inmate – two characters whose mutual hatred and twisted, selfish natures are guaranteed to bring about its dissolution – as he well knows. Nurse Clock has morbid interests. She is a woman I would fear were it not for my superior position. His other chosen heir is Studdy, a mean-spirited Irish blackmailer, petty thief and trickster, foul-mouthed, crude and vulgar, a lover of lacerating innuendo – the most misanthropic of this group of lost, superfluous souls. Bird’s legacy then is the engine of the plot. Each of his desolate residents – selected by him because they resemble him in having ‘neither family nor personal ties’ – is shown with all their foibles and weaknesses. he had studied the condition of loneliness, looking at people who were solitary for one reason or another as though examining a thing or an insect beneath a microscope. Boarding-houses were becoming a thing of the past; bed-sitters and shared flats were the mid-century rage in London. the solitary man is a bitter man, and that bitterness begets cruelty. 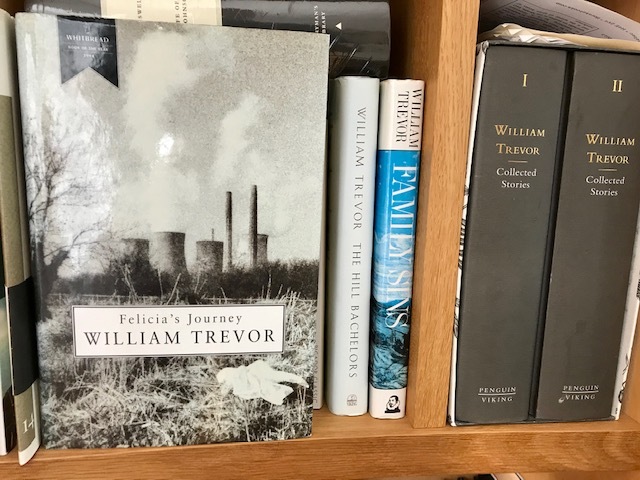 Like Barbara Pym, to whose novels this one has been likened, Trevor anatomises the marginalised, solitary souls who’ve lost connection in the modern world. Their God is a deus absconditus – or worse, if bitter, cruel Mr Bird is his incarnation. His name might imply the Holy Ghost, but he’s no Mr Weston dispensing good wine. He deals in something more vitriolic and destructive. 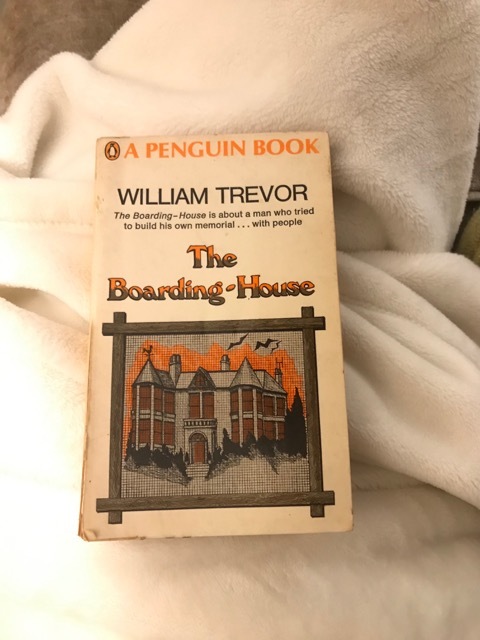 Trevor’s cross-section of a part of English life is darker, more surreal and less genteel than Pym’s (maybe more like Elizabeth Taylor’s darker work). These eccentrics are secretariies, clerks and district nurses, vindictive petty criminals, or a phony ex-Army ‘officers’ who frequents sleazy strip-joints, can’t hold his drink, and specialises in ‘dumb insolence’. Pathetic Miss Clerricot has spent decades waiting to be propositioned but when it appears to happen to her it’s as disastrous and farcical as the rest of her timid life. The prose style and narrative technique owe more to Beckett and Joyce than Pym. There’s more than a touch of Sterne as well in the bizarre eccentricities of the characters and their actions, and the flitting, shifting nature of the narrative. I hope I haven’t made the novel sound too dour; it’s outrageously, twistedly funny, but it’s the humour of Beckett’s godless tramps beneath a gallows.